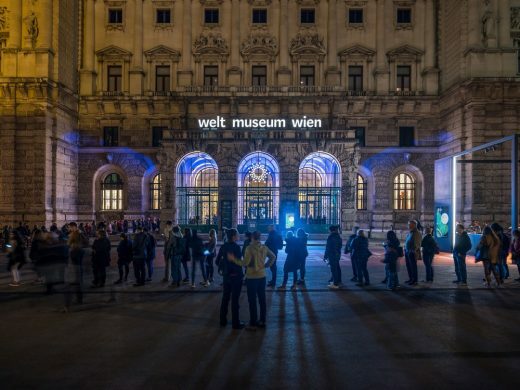 Following an international open competition in 2013, Hoskins Architects – in collaboration with Ralph Appelbaum Associates – were appointed to redevelop the Weltmuseum Wien’s exhibition and visitor facilities. 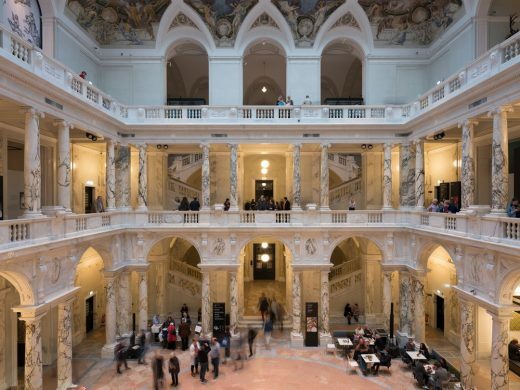 The 7,500m² museum is situated in the historic Hofburg Palace in Vienna and includes 2,400m² of permanent exhibits and 1,400m² of temporary exhibition spaces. The museum opened to the public on the 25th of October 2017. A contemporary multifunction ‘cube’ in front of the main entrance highlights the museum’s public presence on Heldenplatz. 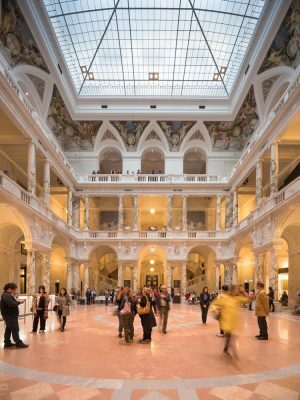 New reception and introductory spaces lead visitors to the Säulenhalle – the heart of the museum – where visitors can relax in a new café area. From this dramatic space visitors can directly access the temporary exhibition spaces, new museum shop and a new auditorium at ground floor level; or the permanent collection and education facilities on the upper floor. The design incorporates a consistent architectural language, sensitive to its historic context, which works with the exhibition design to create a clear and coherent museum. The museum owns one of the world’s most important ethnographic collections of more than 250,000 objects from non-European cultures. The origins of the collection go back to the 16th century. The establishment of the museum in the Vienna Hofburg dates back to the Archduke and Crown Prince Franz Ferdinand of Austria-Este (1863-1914), who in 1907 planned to display his private collection of some 14,000 objects collected at the end of the 19th century on his world tour. 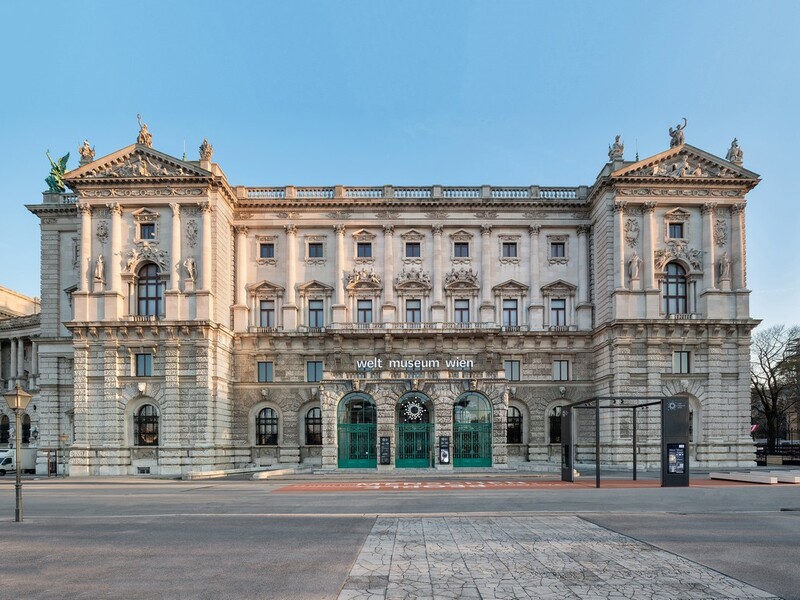 As a location for the collection, the residential section (Corps de Logis) of the Neue Burg was chosen, the monumental extension of the Vienna Hofburg, which was built in 1881 as part of the so-called Kaiserforum based on the designs of Gottfried Semper and Carl von Hasenauer. The collection was opened in 1912 in the Corps de Logis. After the violent death of the heir to the throne, the subsequent First World War and the end of the Danube Monarchy in 1928 the Museum of Ethnology was founded in the same location. Following a renovation of the building envelope between 2004 and 2006, the museum lacked the money and above all the concept for a new orientation and redesign of the content. 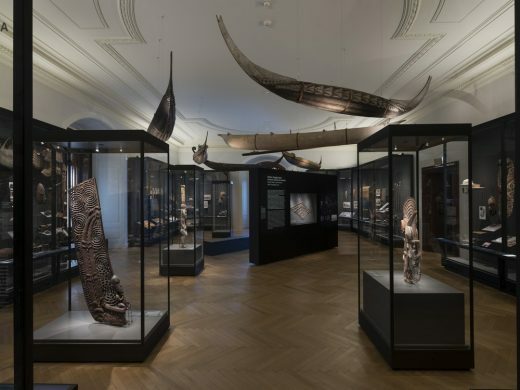 Like all ethnographic and ethnological museums in Europe, the Viennese Museum was faced with the question of how the museum should behave in relation to its collection, in particular the circumstances of its creation, and the colonialism of dealing with foreign cultures. The permanent exhibition of the Vienna Museum of Ethnology had already been closed for eight years, when in 2012 the museum reinvented itself as the Weltmuseum Wien with the Dutchman Steven Engelsman as museum director. 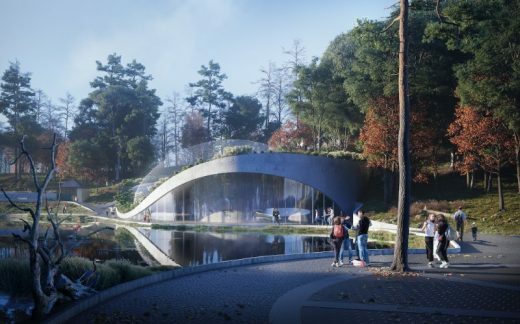 In 2013, the team of Hoskins Architects (architecture) and Ralph Appelbaum Associates (exhibition design) emerged as the winner of a multi-stage international competition. 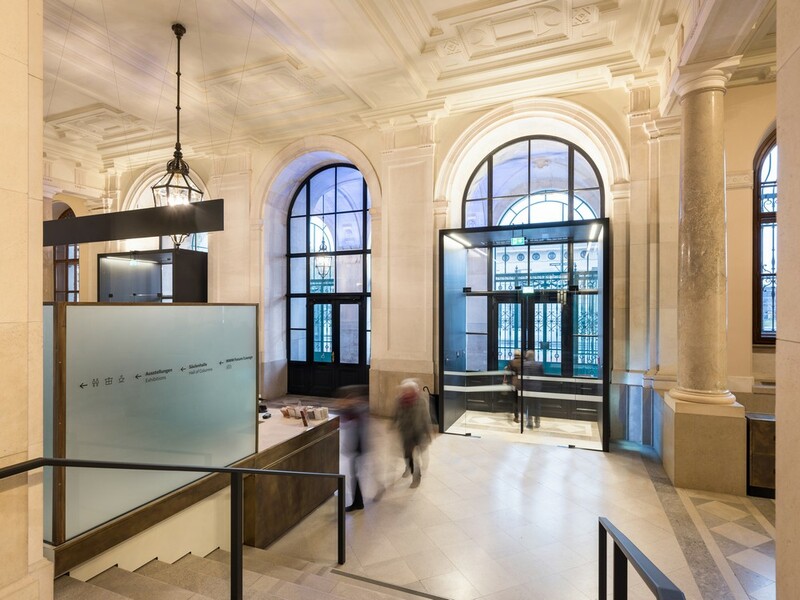 The design challenge was to implement the refurbishment of the content of the museum and at the same time to take the historical collection and the historic building as well as the entire surrounding conservation area into consideration. 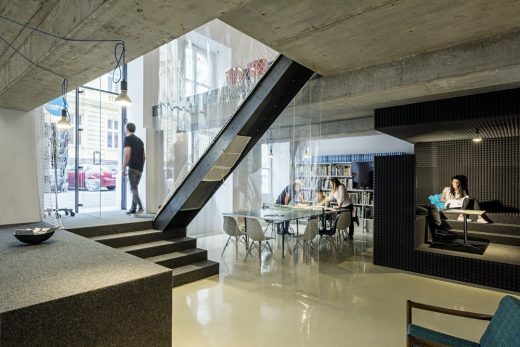 The approach of Hoskins Architects and Ralph Appelbaum Associates was therefore holistic. Architecture and exhibition design should have a common starting point. 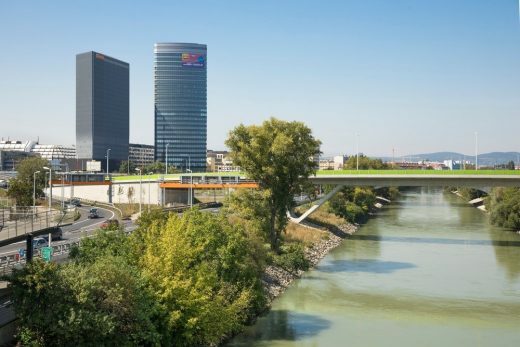 The central aim of the concept for the new museum was to present the outstanding collections with their cultural diversity in their current and historical relationship to the world and to Vienna. 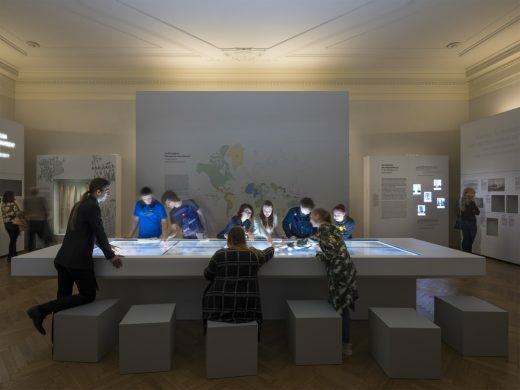 For the integration of the Weltmuseum in the wider area – how to approach the museum and the significance of the museum within the wide Hofburg – historical planning documents by Semper and Hasenauer were used to support the design process. Historic lines of sight and routes from Hendenplatz over the famous Ringstraße, to Maria-TheresienPlatz and the adjacent Museumsquartier were emphasized, framed and preserved. 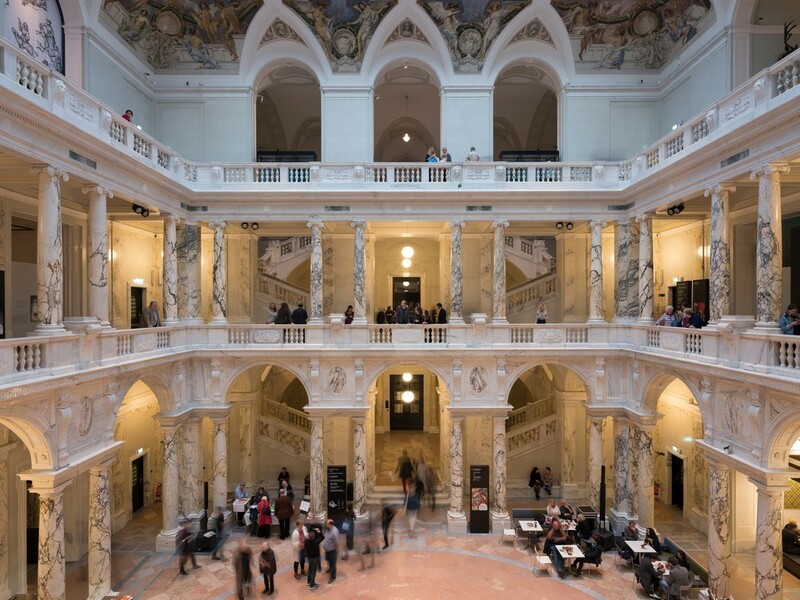 The new Weltmuseum Wien expands the impressive collection of museums along the Ringstraße and presents itself to the public as an equal with a self-confident manner. Its main focus of cultural diversity is increasingly relevant in today’s world. 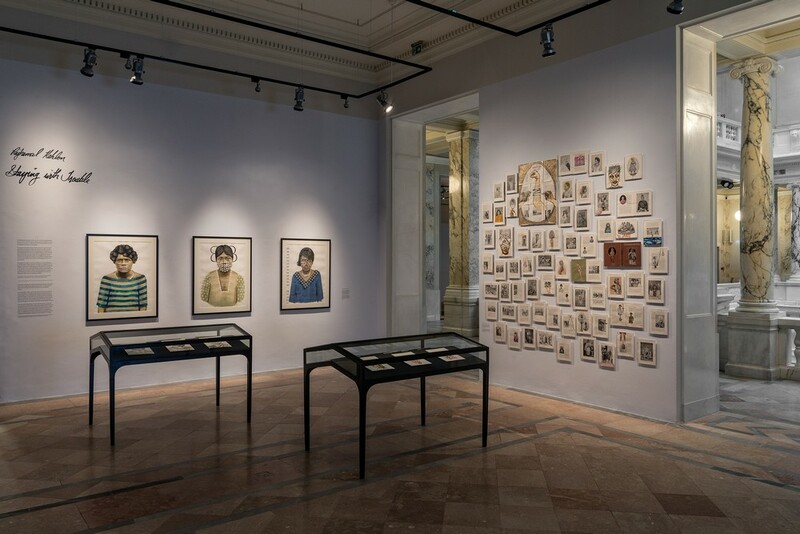 In order to improve the visibility of the museum in the surrounding environment and to revive the space in front of the entrance, an identity-forming external presentation was developed. The Museum attaches great importance to bringing the museum’s contents to life beyond the walls of the palace building. In close cooperation with Heritage bodies, an action space with a media cube, was located in front of the entrance to the Weltmuseum, which will be used for outdoor film screenings, as a stage and also as a pop up café. 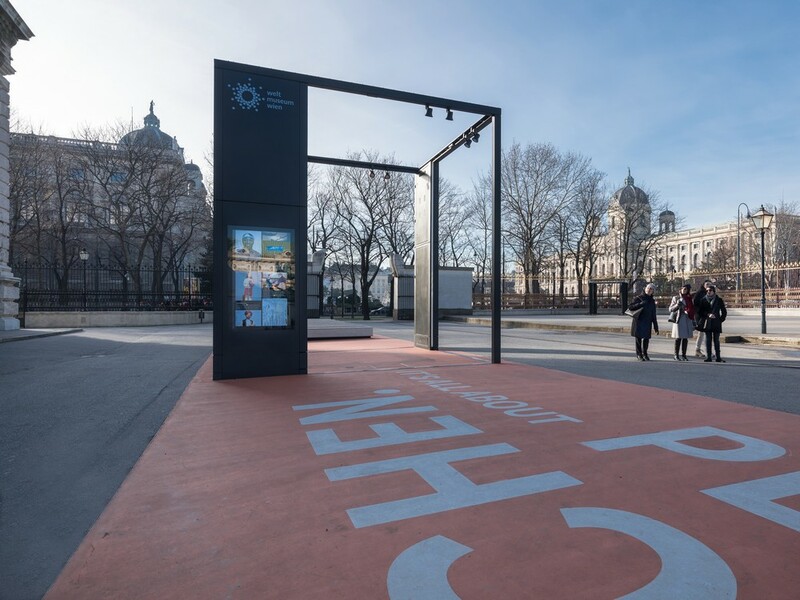 From spring 2018 a variety of events will take place, bringing the contents of the museum out to the public realm. The architectural design scope encompasses the entire Weltmuseum Wien facilities. A contemporary multifunctional cube in front of the building is the first impression of the revitalised museum inside. As well as offering information, it can also be used as a projection surface, an event stage and an extension of the museum café in the summer months. The main entrance to the Corps de Logis-Building has been given a new, inviting identity. Once inside, the updated orientation system takes visitors to the newly designed reception area in the First Vestibule. 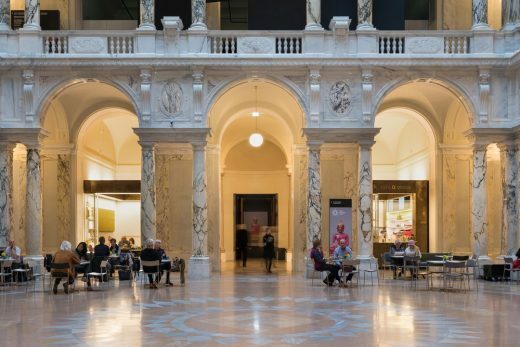 Visitors will then follow on to an interactive orientation area in the Second Vestibule, before leading them into the magnificent Columned Hall that forms the heart of the museum. A new café and museum shop are carefully integrated into the Columned Hall, which is freely accessible. The ground floor of the hall is made up of 1.400 sqm of temporary exhibition space, updated to comply with modern standards. A highlight of the redevelopment is the completely redesigned 2.500 sqm permanent exhibition situated on the first floor. 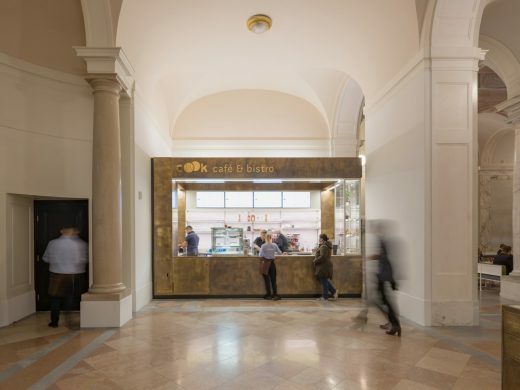 A carefully crafted new event space in the neighbouring segment of the Neue Burg is accessible from the Columned Hall and directly from the Heldenplatz, giving both the Weltmuseum Wien and the other KHM-Museums many new opportunities for programming. The materials for the architectural elements are chosen on the basis of the historical character of the building, creating a consistent formal language with subtle contemporary details. 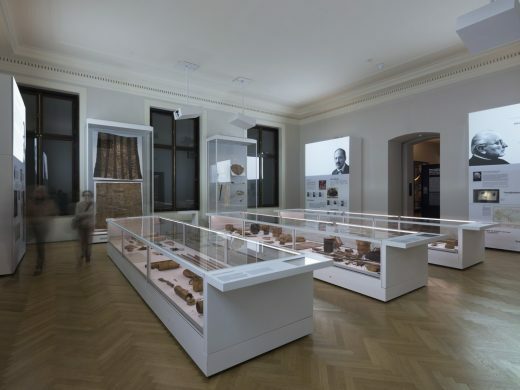 The objective of the exhibition design was to create a series of characteristically independent exhibit halls, tailored to the unique stories of the Weltmuseum Wien, yet still resulting in a coherent visual language. 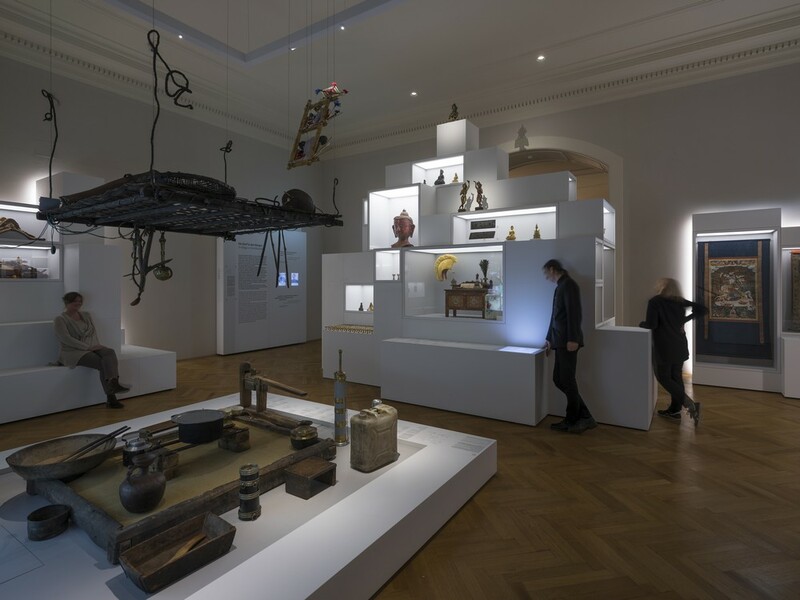 The design process started with an exploration of the impressive collections of the Weltmuseum Wien, and an inspection of the historical display cases that were installed in 1912. 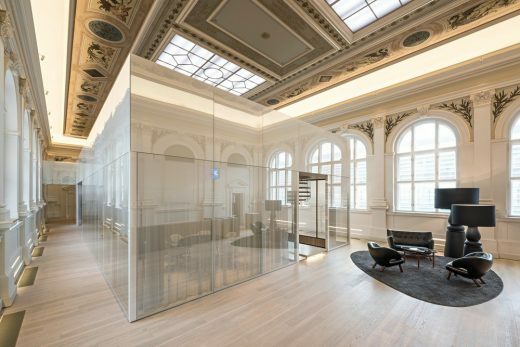 These display cases featured surprisingly complex technology that allows for a very elegant style, despite rather large and heavy glass panes. As they did not adhere to today’s museum standards, Ralph Appelbaum Associates decided to restore as many of the historical cases as possible, and to equip them with the necessary technology for the 21st century. It was very important to develop exhibit halls with a completely new design language that directly translates the key content messages. Based on the stories and the selection of artefacts, RAA planned a new, purely white display system to contrast with the graphite historical cases. This design also complemented the Weltmuseum Wien’s curatorial concept of juxtaposing collection centred exhibit halls with more discursive halls that convey their content primarily through interactive media and graphics. Thus the Japanese Hall features the impressive model of a Daimyo residence in the centre of the space, while the surrounding historical display cases compare how Japanese culture was perceived in Europe before and after the country opened itself up to the Western world in 1873. 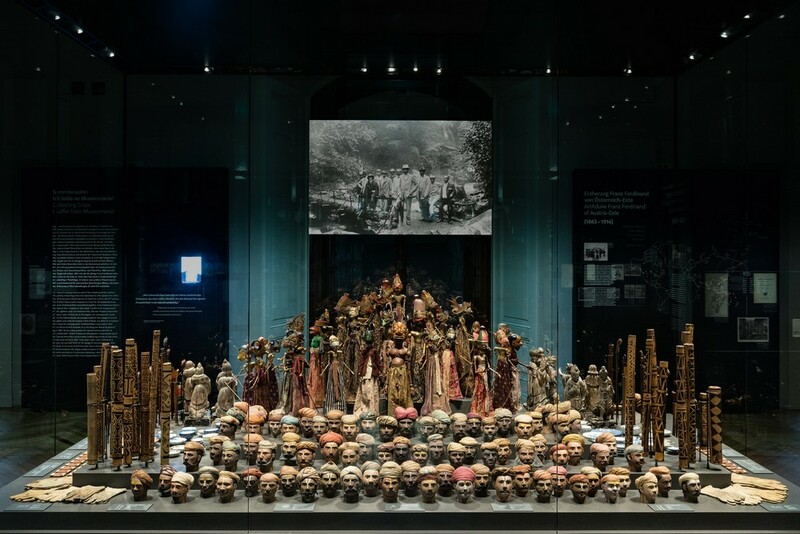 In comparison, the exhibit hall on the famous Vienna School of Anthropology explores not only a discussion among scientists, but also presents science as a historical process full of subjective perceptions. 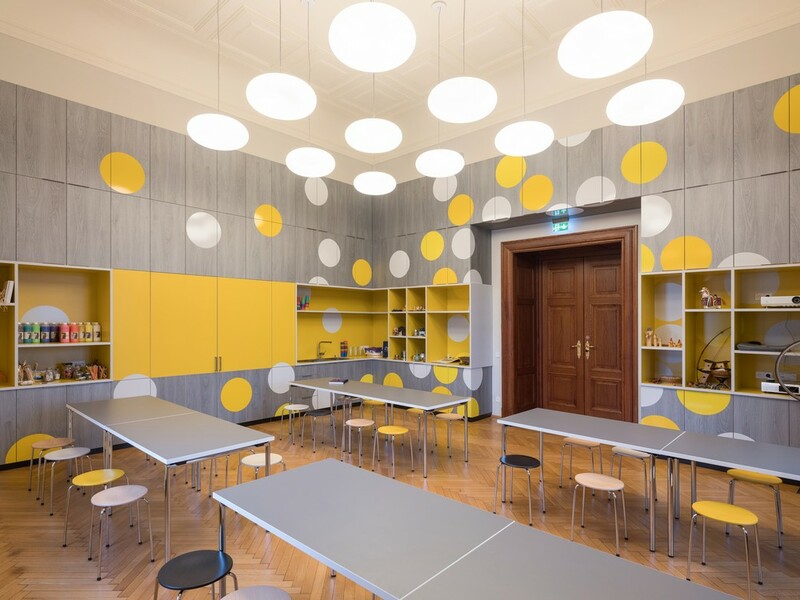 RAA therefore developed Theme Walls that present four different discursive positions in the lower part, while using the upper part for a media installation where the protagonists directly confront each other through interviews or quotes. 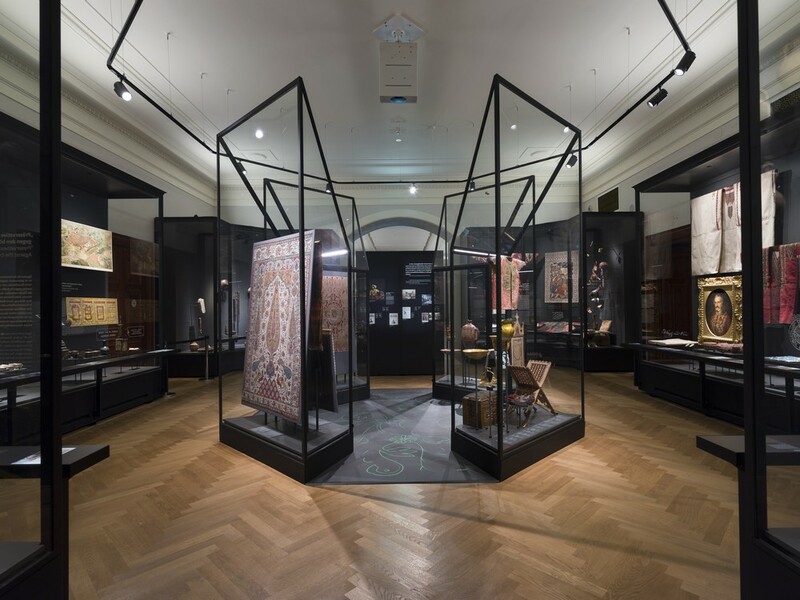 By working closely with the Weltmuseum Wien – the directorate, the curators and the conservators –, RAA has created individually designed exhibit halls, each uniting content and design in their own way, while still forming a strong and connected visual language for the whole exhibition.